The Johnson State College student newspaper, Basement Medicine, printed an article this week about Friday's Alternative Media Day. I'll be on both of the event's media panels — one in the morning, one in the afternoon. The morning one talks about blogging, the afternoon one about the state of the alternative media (print, tv, radio, online) in Vermont. Though there are plenty of other panelists, the JSC article prints only a picture of me. Why? Not sure. They probably lifted off a Google image search. Here are two pictures I found online of two of my other blogger panelists, Bill Simmon of Candleblog, and Jessamyn West, of librarian.net. The photo of Bill is courtesy of NTodd's excellent Friday Coffeeblogging photo gallery. 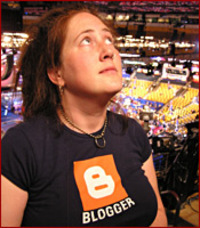 The photo of Jessamyn I snagged from this boston.com special item on the 2004 DNC bloggers. Sadly, the JSC article mistakenly lists Bill as the publisher of a blog about candles, and doesn't cite Jessamyn's librarian blog. Darn journalism students. Will they ever learn? It's a search engine. Called Google. Check it out. hey thanks for that! yeah, my blog is pretty easy to find isn't it? Type librarian into Google, click "I'm feeling lucky" Looking forward to seeing you there. Hi. Elizabeth Bingham, editor of JSC’s newspaper Basement Medicine, here, and I just wanted to quickly respond to your comments on our article about Alternative Media Day at JSC. First off, as a heads up, we will be running a correction in our upcoming issue for our misrepresentation of Bill Simmon’s Candleblog. As I’m sure you know, sometimes all the editors in the world just can’t catch every mistake, and we certainly feel awful about misrepresenting Mr. Simmon’s work in our article. But as this response is directed to your blog and not Mr. Simmon’s, what I’d really like to say is that I was sincerely offended by what you had to say about our staff. As you noted, we are journalism students, and we work very hard at what we do for no pay and very little credit. We do this because we are dedicated to journalism, and because we want to learn all we can before trying it out in the big leagues. We are learning as we go, and we make mistakes from time to time. It’s really unfortunate that we aren’t able to log on and correct our mistakes instantly. We’re print media, and that means that our mistakes are there to stay, even after we run corrections in subsequent issues. I appreciate what you’re doing in standing up for and supporting your colleagues. I hope that you can understand that I feel the need to do the same. Sean Chen-Haider, whose story we’re speaking of, is a valued member of our staff-- and I’m darn proud to have him on our masthead. Everyone makes mistakes sometimes, and yes, I’m confident that whether we’re supported or dejected by those who have stood in our shoes before, we darn journalism students will learn. That’s what we’re working on, and many other articles and issues that we’ve published have been a testament to just how much we’ve picked up along the way. In any event, I really do appreciate it when readers point out our mistakes, and I thank you for helping us in that regard. If there’s anything in the future that you would like to point out to me, please feel free to email me directly as well. There’s a link to my address on the online masthead. I realize you're all doing this as students and volunteers. I know exactly how hard it is to put out a print newspaper without mistakes in it. As a writer for Seven Days, I make my share of mistakes. Heck, in this week's paper, a big chunk of my story went missing after I'd meticulously checked and rechecked it (through no fault of my own). I've had to have corrections run on my stories for stupid things, like misspelling someone's name, which I've done a few times. That happens to everybody at some point. And when I was editing and publishing the Winooski Eagle last year, a job I actually ended up paying to do, I was astonished at how much work it was just to put out one issue of a monthly paper. I appreciate how difficult it is to do what you do, and I'm glad you're making the effort. You deserve more credit, I'm sure, than you get. On the other hand, the mistake about Bill's blog was pretty easy to find. I was probably a little snarkier about pointing it out than I should have been, but I'm not sorry to have pointed that out on this blog, especially since it's a story about bloggers. I actually looked for your email to write to you and tell you about it, but couldn't find it on the site. Guess I didn't look hard enough! I did, however, email JSC Journalism professor Tyrone Shaw to let him know that I had posted a response to the story on my blog. So I *did* contact someone at JSC to let you know what I had written. Honestly, I would have linked to the story anyway to promote these panels that Bill and Jessamyn and I and a bunch of other people are going to be on. I only pointed out the errors because they were there and I couldn't link to the story and not notice them. I thought I striking the right tone, jokey but admonishing, but maybe I joked too far. Anyhow, thanks for responding on my blog here. Geez, I hope you'll still stop by our panel and meet us. We're nice people, really. Shukoor Ahmed ran for a seat in the Maryland House of Delegates in 1998, after coming to America a decade earlier from Hyderabad, India. Campaigning door-to-door, he was surprised so many voters did not know who represented them!